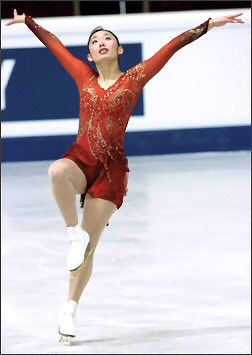 Miki Ando landed her first triple Axel while practicing at the World Juniors in Ostrava in 2003, but had actually landed the quad salchow more than two years before that. Ando has also won five Junior Grand Prix events since 2001, but until this season, she found it difficult to reach the top of the podium in Japan. She was third in novice in 2000, third in juniors in 2001 and third in seniors in 2002 before finally winning the Japanese ladies championship for the 2003-2004 season. That was another reason that she continued to compete as a junior. “I didn’t think I was good enough for senior level,” she said. Ando completed her best season by placing fourth at the World Championships in Dortmund, Germany just two weeks after Junior Worlds. Although the events were only a short distance apart, Ando returned home to Japan to make the adjustments in her junior program required for senior competition. “I would rather have stayed and trained in Switzerland,” she admitted. But the complexities of her training regimen required her to go home. She trains with both Nobuo Sato in Nagoya and Sachiko Kozuka in Yokohama. That requires her to travel one or two hours on the TGV train between training rinks. Ando trains two to three hours a day during the week and five or six hours on Saturday and Sunday. Off ice, she includes weight training with physical conditioning, but doesn’t participate in any other sports. That’s a far cry from her earlier life when she participated in everything. “I did many, many things before skating,” she said. “I tried swimming, cycling, playing the piano, calligraphy and many more things. I didn’t start skating until I was nine after I went to the rink with some friends from school. I thought it was the most interesting for expression and playing a character.” Within two years, she had landed her first triple jumps, a triple salchow and a triple toe loop, although she couldn’t remember which came first. She landed her first triple Axel while practicing at the World Juniors in Ostrava in 2003, but had actually landed the quad salchow more than two years before that. She is also practicing the quad loop and the quad toe loop and tries to throw a quad in every competition. “It’s important for my future performances to always try the quad in my programs,” she said. Lea Ann Miller choreographs her programs. “She always chooses the music,” Ando said. “I don’t have one kind I like best. I’m trying different styles of music.” She usually changes both programs each year as she did for this season. For the short, Ando used The Pianist by Chopin and for the long, Stravinsky’s Firebird. Miller chose Firebird to symbolize Ando’s breaking out this season, similar to her choice of gold blades as a symbol of a champion. Her exhibition program was to Moonlight. Off ice, she likes to go shopping, go out with her friends, dance, and chat via email, instant messaging and text messaging. One of her favorite pastimes is to make photos with her friends and print them out at photo shops. She also likes to collect videotapes; especially Disney animated films and Japanese anime. She keeps all the stuffed animals she receives and especially likes Snoopy toys and teddy bears. She also has two pets, a dog and a parakeet, which can say ‘Hello and I want to eat’ in Japanese.